It has been a challenging month. There has been death, a need to help loved ones make a major transition in their lives, the end of a school year (my fellow teachers will understand what that means), and car troubles. And there have been times when I wondered how in the heck I was going to get from here to there – both figuratively and literally. 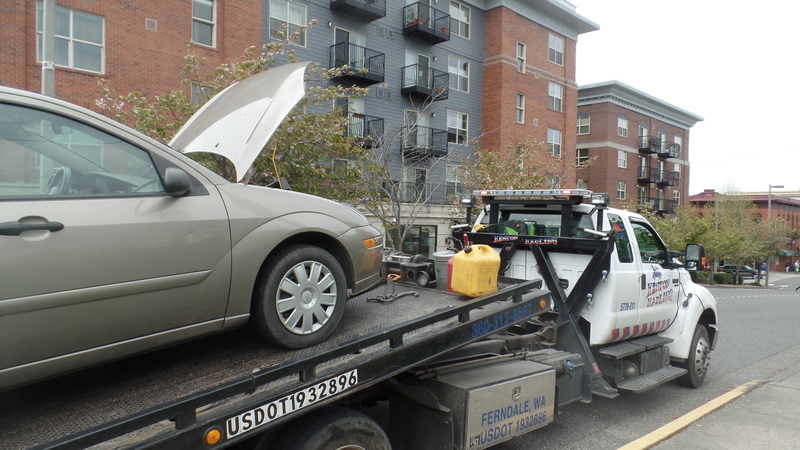 – You may remember that several weeks ago I wrote about an adventure I had with my car – the alternator gave out on me in downtown Bellingham – and that adventure led me to meeting some really nice people and finding a paper clip at the end, too. But after the alternator adventure my car continued to make squeeks and squawks and screeches, and so last Monday I took it in to have it checked. I do not have the mechanical language to tell you exactly what they diagnosed, but it involved a ball bearing in the clutch, some leaking fluid, and something to do with the thing that’s attached to the muffler. Yup. My car has been in the car hospital all week. My husband has been shuttling me into work in the mornings, and my sons have been shuttling me back home again in the afternoons. These daily commutes have brought unforeseen blessings to me. I’ve been used to sitting in my own thoughts to and from work – and I’ve always kind of enjoyed that quiet alone time – but I’ve found a lot of joy in being able to hold conversations with my husband and sons while they are trapped… I mean… sitting… in their cars with me. I’ve had twenty minutes with my husband that I don’t usually have during the day – we’ve gotten caught up on what’s going on with family, friends, his work and mine. We’ve talked about politics, world news, and community happenings. We’ve laughed, and we’ve been serious, and we’ve ended every commute with a kiss. My sons and I have had the opportunity to talk about past, present, and future. They’ve shared their wisdom with me, and their insights on life, and they’ve shared their humor. I’ve learned a lot from them this week. – One afternoon I found myself stalled-out on an Algebra problem I was working on with one of my students. It was actually a pretty simple problem – using long division to solve a quadratic equation – but the math compartment in my brain just seemed to shut down all of a sudden. And then I remembered that my eldest son – the mechanical engineer – was going to be picking me up at the end of the day, so I gave him a call and asked him if he could come in a little early and help Carlos and I work through this algebra problem. The son agreed to come in and help us, and he was wonderful! He was calm, he was patient – he knew exactly what to do to get through the problem, and he knew exactly what to say to help Carlos understand how to get through the problem. A blessing. – At the end of February my beloved calico cat, Freckle Rose, died. I have felt the loss of Freckle Rose terribly. But out of this loss has come another blessing. My parents are in the process of moving out of their home of 48 years into a home more suitable to their current needs. My parents have five cats, and knew they were going to need to find homes for at least a couple of them. Mom asked me if I’d take their cat, Gabby. So I brought the cat carrier down to my folks to pick up Gabby-cat. But as soon as Gabby saw the carrier she headed for the farthest corners of the house – she wanted nothing to do with that thing. Enter Princess. 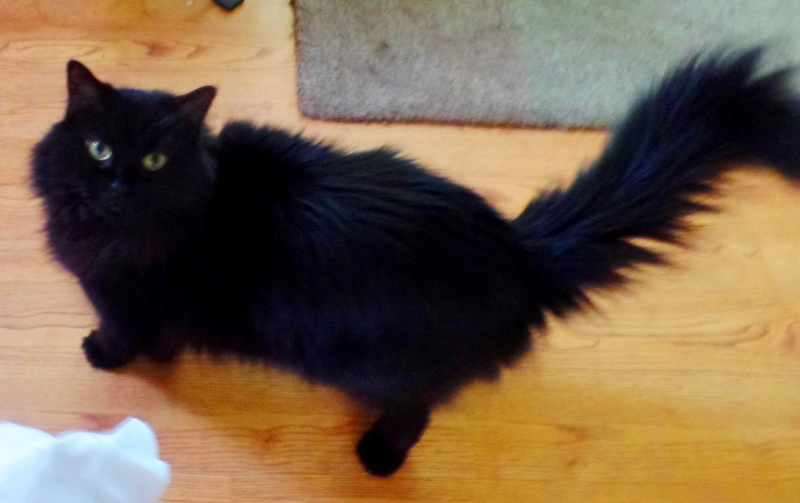 Princess is a fluffy little ball of ebony fur who adopted my parents about four years ago. Princess looked at the carrier, looked up at me, looked back at the carrier, and calmly and deliberately walked right into it! She was meant to be with us. When we brought her back to our house she was a little shy – but as soon as I sat down on the sofa and opened up my laptop – BOOM! – Princess was there – walking over the keys, rubbing up against my arms – what is it with cats and laptops? 🙂 Princess has brought feline ambiance back into our home. Our home really needed some feline ambiance. – Our neighbor and dear friend, Mike, passed away this week. Mike and his family are some of the most wonderful people you’ll ever meet – kind, funny, quirky, genuinely caring people – all of them were a huge support when I went through a personal crisis a few years ago. 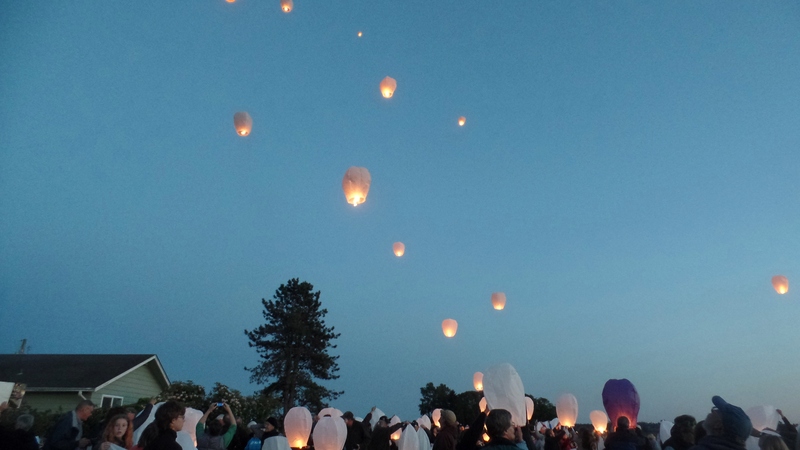 Before Mike passed on, his family and friends organized a sky lantern extravaganza in celebration of Mike’s amazing life. Apparently Mike had bought, like, a gazillion sky lanterns some time ago – never realizing, his wife said, that they’d be used to celebrate HIS life. And so we all met – friends, family, neighbors – in a green field in Bow to send our lanterns of love into the sky for Mike. Mike arrived just before the lanterns alighted and was able to watch the magic from the comfort of a car. It was good to see him there. Being able to celebrate Mike WITH Mike – instead of after him – was a huge blessing – a magical, teary, amazing time. I’m so glad I could be part of that. – The end of a school year can be a really stressful time for teachers and students as they try to wrap up the year. Sometimes it can be a little overwhelming – there are state assessments for students to pass, courses for them to complete, and graduation busy-ness. But there have also been a lot of blessings this year. This week one of my seniors presented her Culminating Project PowerPoint to the staff – and she did a most excellent job of it, too. At the end of it, the director of our school asked my student what the best part of her time at our alternative school has been for her. My student answered, “My teacher. 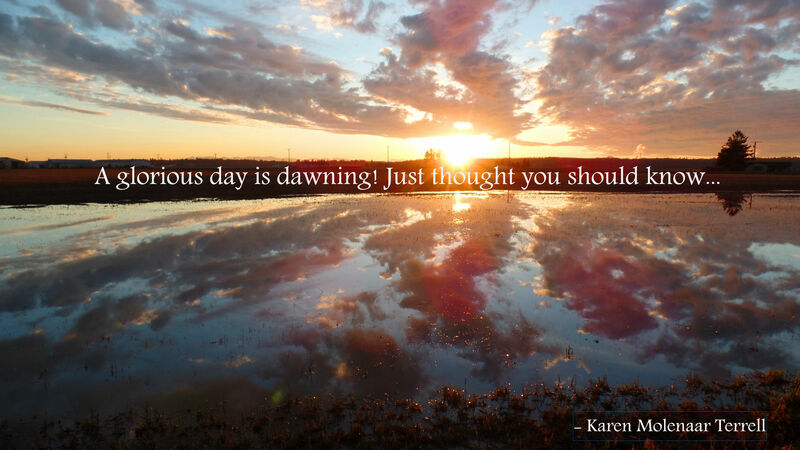 Karen believed in me when I didn’t believe in myself.” Oh gosh. I started tearing up. That – right there – that is why I teach. Blessings. – One of my sons let me use his car to get to the testimony meeting that I needed to conduct on Wednesday. As soon as I started the car I realized I was going to need to get some gas for my son – the tank was almost empty. Normally the getting-of-gas would not be a big deal to me. But by Wednesday I was feeling totally over-the-top mentally and emotionally stretched – I felt like those street performers who spin plates on their noses and toes whilst juggling fiery torches – adding even one more teensy thing to my juggling torches and twirling plates made me wonder if I had the mental wherewithal to keep it all from crashing around me. But I took a deep breath – asked myself how hard it could be – and decided it would be best if I stopped on the way to the meeting to get gas, rather than afterwards. I tried to remember which side of the car the gas tank was on – and I guessed my side – and I remembered that you couldn’t just open the flap to the gas tank – there was some super-secret something I had to do – I figured when the time came I would figure it all out. My son drives an automatic and I am used to driving a stickshift – so there was that – my left foot kept searching for the clutch. It was raining – where were the windshield wipers? And whoah! How did you slow them down?! And it was getting dark – where were the lights? I got all that sorted out before I reached the gas station – I started to pull into a gas lane just as the attendant put a cone down to block it off – I tried to pull around and ended up in reverse somehow – but there was no one behind me – blessings. I finally got myself pulled next to a gas pump – and found I’d been right about which side of the car it was on. And when I opened the door to get out of the car I looked down and discovered a little lever that would open the car’s gas tank – blessings. I know this all seems like simple stuff – but it’s amazing how each little thing can seem like an almost-insurmountable mountain at times – and it’s amazing how grateful a person can be when it all works out. You’ll need a little background to understand what that bouquet meant to me: Eight years ago, on an Amazon religion discussion forum, I started a new religion – Humoristianity. The people who were attracted to the Humoristian “temple” represented a wide range of religious and non-religious backgrounds – there were atheists, Methodists, Jews, Catholics, a couple Mormons, and at least one Christian Scientist (moi). But what they all had in common was the ability to laugh at themselves, and to laugh with me at the nonsense of life. This little community of friends has been with me through the good times and the challenging times. I’ve been blest to meet half a dozen of them in the person – and continue to be friends with many of them on Facebook. They are like a second family to me. And apparently one of them had discerned that I needed flowers. 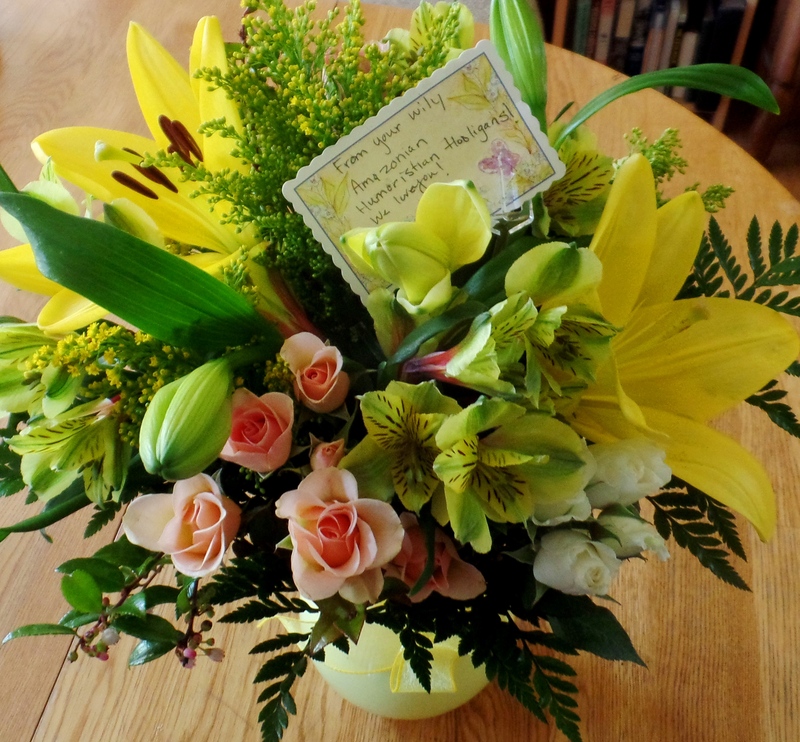 It was totally unexpected – a complete surprise – I never could have seen it coming – but I am so grateful for the love these dear people showed to me with that lovely bouquet. I am blest – I really am. I’m blest with the physical stuff – the roof over my head, the food on the table, the water coming out of our pipes. But more – so much more than that – I am blest with love – the love of a new cat in our lives, the love of my family, the love expressed in my community for a dear neighbor, the love from my students, and the love from my Humoristian fellowship. There is power in Love – the power to lift up a burdened heart, and to help our fellow humans see that they matter. Dear reader, may your moments and days and years be filled to over-flowing with Love. What prayer feels like, for me, is… it’s like waking up to a beautiful sunrise in the morning or listening to an inspiring piece of music, or looking at the stars on a clear night – it’s a feeling of uplift – of thoughts soaring, of fear dissipating, of a consciousness full of joy and good will. Often times my prayers come with humor – laughing always seems to help get rid of fear for me – and for me, fear is always a part of whatever problem I’m facing. And Love is always a part of the healing. I’ve sometimes known I was healed before I saw the healing manifested humanly – I could feel the change in my thoughts. Yeah. Christian Science. The people who let their children die because they don’t believe in Tylenol. Eff off. I was raised by a CS mom (now 87) and a non-religious dad (will be 97 in a month), and I could not have asked for better parents. My parents maybe didn’t share the same religious beliefs, but they shared the same values and taught their children to take care of the environment, to appreciate the beauty of nature, to look for the good in people, to play fair, to not be quick to judge others, to not buy into every piece of hearsay, rumor, and gossip that comes our way, but to do our own research, and question our own beliefs and biases, and recognize the biases of others, too. I’m really grateful they are still in my life. Karen, can the core beliefs of CS be boiled down to a few bullet points? Can you try to list them as far as you understand them to be please? Hi Weasel, It’s probably important to note that I am not an official spokesperson for the CS church or anything – and I do not speak for any other CSists – just for myself. CSists come in all shapes and sizes and colors and political parties and most professions (I even knew a CSist who was a dentist 🙂 ). There’s no one in our church leadership telling us how to vote or who to vote for or where to stand on social-political issues – that is left up to individual conscience. Some CSists are religious. Some are not. I am not. In my mind I make a distinction between the religion of Christian Science, and Christian Science as a way of living, and a way of looking at the world. – CSists don’t believe in Original Sin, or that God’s children are sinners. – Mary Baker Eddy, the discover of CS, offers these synonyms for God: Principle, Mind, Soul, Spirit, Life, Truth, and Love. There is no evidence whatsoever that prayer works at all (and no, “I prayed and God healed my little girl” is not evidence). There is plenty of evidence that medical care works, preventable errors notwithstanding. I can personally testify to that. Christian Science parents who deliberately withhold medical care from their children in favor of prayer are potential murderers. If their child then dies, they’re actual murderers. That’s the bottom line for me. Lifelong, I suppose there may be CSists who view medical science as The Enemy. I am not one of them. My brother-in-law is an anesthesiologist, my sister-in-law is an emergency room nurse, a niece is a medical doctor, a nephew just graduated from med school – and these are all people I love and respect very much – they are not my enemies – they work very hard to do what they can to help their patients. But they are also all people of integrity and honesty – and I don’t doubt that they’d be the first to tell you that medical science is not perfect – theories about cause and cure are constantly in flux; medications that help one person might kill another; what seems like “good medical practice” today might prove to be the source of woe tomorrow. I’m sure we’ve all had friends and family members for whom the medical treatment that was supposed to cure them actually ended up killing them – I know I have. And I’m pretty sure we’ve all seen those commercials on television that tell us about the side effects of drugs that might include liver problems, depression, vulnerability to infections, diarrhea, nausea, death, etc. – I’m always wondering who is running out to get those medications, you know? I think a healthy skepticism in regards to medical science – as well as Christian Science, faith healing, religious beliefs, mass media, and political propoganda – is a good thing. Blind and unquestioning trust in any form of treatment does not seem very healthy to me. In the beginning of the book, Cousins tells us about the illness from which he was told by medical specialists he wouldn’t be able to recover. He briefly describes how he declined to accept this medical verdict for himself, and with the support of his personal physician, set about putting into action a plan of treatment for himself which included plying himself with high doses of ascorbic acid (vitamin C) and humor (Candid Camera episodes, and Marx Brothers movies).Cousins was able to recover from his illness and later wrote a story about his treatment and recovery for the New England Journal of Medicine. Cousins talks about the need so many seem to have to see their doctor DOing something, and giving them something tangible to help them. But Cousins suggests there may come a time when these “tangibles” are no longer needed. Near the end of the book, Cousins asks the question: “Is there a conflict at times between the treatment of disease and the treatment of human beings?” What a great question! If a doctor treats his patient as just a lump of flesh to be prodded, injected, weighed, measured, and tested then, I think, a really important part of the healing process is missing. The best doctors, to my way of thinking, are the ones who are able to listen to their patients, reassure them, provide confidence in their healing, and value them as partners in the process. In my life I have encountered several practitioners with these fine qualities. After reading Cousins’s book, and the letters he included from doctors around the country, I am encouraged to believe that there is a growing number of medical physicians ready and willing to treat human beings, rather than just disease. “It might actually be easier to start with what CSists don’t believe: – CSists don’t believe in an anthropomorphic god – CSists don’t believe in pleading, cajoling, and begging a capricious supernatural god who might choose to heal, or might choose to not heal his children” OK, final question for now Karen: I always thought that Christian Scientists WERE praying and pleading with a capricious supernatural god to heal illnesses rather than take a family member to a doctor. If not, what is the exact nature of the prayer involved? “God is not moved by the breath of praise to do more than He has already done, nor can the infinite do less than bestow all good, since He is unchanging wisdom and Love… Prayer cannot change the Science of being, but it tends to bring us into harmony with it… The mere habit of pleading with the divine Mind, as one pleads with a human being, perpetuates the belief in God as humanly circumscribed,- an error which impedes spiritual growth. Personal question Karen: you don’t believe as your parents do but you still self-identify as a Christian Scientist? My dad is non-religious. My mom is… she is simply wonderful. My mom wasn’t raised in CS – she found Christian Science not long before she married my dad – she was attracted to this way of life because she liked the idea of a God who is Love – a Love that heals. She never had any kind of official position in the church or anything – like me, she is not really a very religious person. She is an independent thinker and a free spirit – not into group-think. I identify as a Christian Scientist because I really like the ideas and thoughts found in the CS textbook – I believe in God as Love, and I’ve experienced healing through my understanding of Love. “I identify as a Christian Scientist because I really like the ideas and thoughts found in the CS textbook – I believe in God as Love, and I’ve experienced healing through my understanding of Love.” Thanks for the insight Karen. Anyways, like many here I’ve always had a negative opinion of Christian Scientists so I appreciate an intelligent perspective from somebody like yourself. Art, You write: “Anyways, like many here I’ve always had a negative opinion of Christian Scientists so I appreciate an intelligent perspective from somebody like yourself.” Thank you. Michael Nesmith is a devout CS (as I’ve mentioned to you on a previous occasion) but you wouldn’t know it by listening to his music. It didn’t come to my notice until I read a biography about him. Thank you so much for your kind words, I always enjoy our exchanges immensely and recall them with fondness. Regardless of what belief system you might adhere to, you are a shining light. Keep on shining brightly. Oh, Buck “Buck” Buckaw – thank you. You don’t know what your kind words mean to me tonight. Thank you. I am so glad to know you are in the world. OK, that’s enough of the mutual admiration society. We risk turning the whole thing into some sort of giant hug fest and that just won’t do, particularly for the more jaundiced participants of this thrill ride. Now, what were we talking about? Oh yeah…..Christian Scientists hey? What a kooky bunch.